Let’s imagine you approach a T-junction on an average 30 mph road and you intend to turn left. On approach check your rear view mirror and left door mirror to check the speed and position of following traffic. 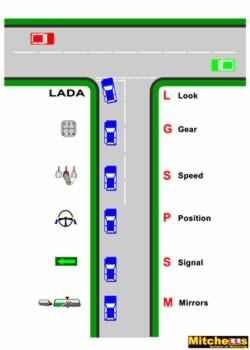 Think about where you will apply your left signal. Ensure there are no other junctions or major openings on the left before the junction as your signal may give the impression you are turning into one of them. If so, delay the signal until you have passed them. Keep to the left (about a doors width or 1 metre from the kerb) and follow the curvature of the kerb so when you come to a stop you are at an angle ready to drive away. Look to the left to see if there are any parked vehicles that will force you to turn onto the other side of the road. If so you will need to give way to traffic from the left. There may be parked cars on the opposite side of the road forcing traffic from the left to approach you on the wrong side. Again you will need to give way as to avoid a head on collision. Check left door mirror just before moving away for cyclists and pedestrians, this is particularly important in slow queuing traffic.